Prain was named to first team All-CAA at the shortstop position. For several weeks in March and April, Prain was the leader in hits and batting average for all of NCAA. Drove in 48 RBI’s, good for sixth in the entire CAA. Prain ended the season ranked number one on the Panthers in batting average and hits, while ranking second in doubles and RBI’s and fourth in homeruns. Hunter was a three-star recruit from Indiana and the son of the Panther’s Men’s Basketball team, Ron Hunter. Hunter was named to the Kyle Macy Freshman All-America team after finishing the year with a freshman-record 17 points per game. Named CAA Rookie of the Year, made the All-CAA First Team and CAA All-Rookie team. Was named CAA Player of the Week once and and National Player of the Week once. Wilson was named the CAA Co-Special Teams Player of the Year and to the All-CAA first team as a kick returner. 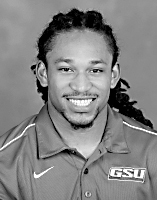 He was also named to third team All-CAA as a wide receiver. Led the team in receiving yards, receptions, and touchdowns, averaging nearly twenty yards per catch. Led the CAA in all purpose yard with 164.5 per game and fourth in receiving yards with 86.1 yards per game. Grey earned Freshman All-America honors, along with All-Region honors and Sun Belt Conference Freshman of the Year honors. Grey’s season culminated in a 2 over par finish at the NCAA Regionals, finishing in a tie for sixth and falling in a playoff for the single individual spot in the NCAA Championship. Long played and started in all 29 games this season for the Panther’s women’s basketball season, leading the team in scoring and three pointers made. Long also played well on defense, ranking sixth in the CAA in steals with 64. She hit six three’s in a home win over Towson on Valentine’s Day.